In order to successfully follow the eating plan for this program, you’ll need a series of 21 day fix tally sheets to go along with the portion control diet containers included in your program. Or if you are doing the portion control diet without using the exercise program, you’ll still need some worksheets to keep track of how many containers you are eating each day and what you are eating at each meal and snack interval. As I have followed the nutrition guide in the 21 day fix tracker, I’ve been following the 1200-1499 calorie bracket plan. I found an excellent shop on Etsy that provides tally sheets you’ll need for every calorie bracket available with the program. You can mix and match the order you eat these throughout the day depending on what kind of meals you like to have or snacks. I recommend having one carbohydrate in the morning to start your day off right since carbs provide you energy and the fiber will give you a “full” sensation to get you through the day. Also try to spread your protein throughout the day instead of having for example four chicken breasts at dinner! >>Get the 1200-1499 Calorie Bracket Package on Etsy that I use here! The tally sheets for the 1400-1799 calorie bracket mean you have a slight change in the amount of containers you can eat. Most men will fall in this category if they are trying to lose 2 pounds per week or women who are taller and thus require more daily calories! As you can see below, you’ll eat an extra fruit, carbohydrate, and 2 extra teaspoons of oils. Using the 21 Day Fix Tracker Worksheets will keep you focused throughout the day and set you up for success. >>Get the 1400-1799 Calorie Logging Sheet Bundle here! 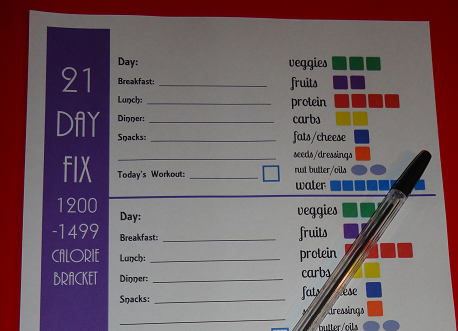 Everyone has a different system of how they use the 21 day fix tracker logging sheets. Some people like to print several sheets off and keep it in a binder in the fridge to tick off throughout the day, whereas others print them off and bring the worksheets in their work/daily planner. Personally, I have one worksheet laminated and on my fridge. Throughout the day, I tick off the containers with a dry erase marker. If I am going to work or out to town, I simply make a memo on my phone of what containers I’ve eaten, and check them of once I’m back home. This is the easiest way for me to be consistent and it also saves on ink and paper by just re-using the same worksheet! However, some people like to keep track of all the worksheets so they can reference back to meals and snacks that they have prepared in the past and repeat them. For all other higher calorie bracket tally sheets for the 21 day fix, you can go to this Etsy shop by clicking here and find all the resources you’ll need!